Flowers have cheered and inspired us throughout history and evidence of flowers have been found in archeological grave sites, hieroglyphics, Chinese writings and in Roman and Greek mythology. Flowers play an important part in our lives as we tend to give them at very specific times. Births, deaths, marriages, anniversaries; there is hardly an occasion that goes by where flowers aren’t thought to be an appropriate part of the celebration. The act of giving flowers really began to flourish from around the time of the middle ages. It was thought the giving of flowers was a way of showing affection, as public declarations of love were very much frowned upon. The Victorians embraced the idea of the language of flowers and many books were written on the subject, explaining what specific flowers symbolised, with instruction of how to arrange them in order to send messages between recipients. As a result, flowers came to have different meanings and each different bloom could be a way of sending your lover secret messages. In fact, flowers were a secret language. As well as sending amourous messages, it was possible to send an innocent bunch of flowers which could be encoded with military information, having the enemy believe it was simply a lovely floral bouquet. In fact, whole dialogues could be made with the gesture of flowers. These messages weren't always sending love, they could also be used to send a message to an enemy. Even the way one accepted flowers, such as which hand you took them in, were part of the code. Flower imagery can be found in most art forms, from paintings to silverware. Apart from being pleasing to the eye and highly decorative, the use of particular flowers was also symbolic. One of Van Gogh's many famous sunflower paintings. The sunflower has popularly symbolised adoration. Image via. Cast floral detail on a Victorian christening mug. Click here to view on our website. You will often see sunflowers (adoration), tulips (perfect love), roses (love,each colour representing a different kind of love), lilies (virtue), daisies (purity), in fact all flowers will represent something, so the list goes on. 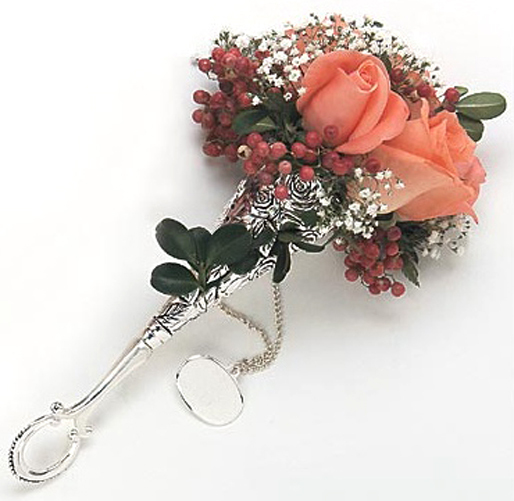 One of the nicest, I think, floral traditions from the 1700s was the Tussie Mussie. Also known as the nosegay, these tiny bunches of flowers would be carried around to fend off the terrible odours which were part of day to day life. Some thought by selecting specific flowers and herbs you might well ward off many ailments too. In some of the reference books of the day, such as John Gerard’s Herball, you would perhaps find a cure for wind, jaundice, or even snake bites. Even today we sometimes look to herbal cures. In the 17th century garden at Kew, they have labelled the plants with their intended medicinal purpose. It is known as the nosegay garden. An ornate Victorian Tussie Mussie available from I Franks. Email for enquiries. A pierced Victorian Tussie Mussie available from I Franks. Email for enquiries. Looking at one of the most famous bouquets borrowing from the ideology of the tussle mussie in modern times, Kate Middleton's wedding bouquet, we can see the symbolism at work. Her bouquet included Sweet William for gallantry, Hyacinth for constancy in love, Ivy for fidelity, friendship and love, and Myrtle as an emblem of marriage. A subtly conveyed message seen by tens of millions. How romantic. Kate Middleton's understated yet poetic wedding bouquet. Image via. So, when creating your tussy mussy you would have many things to consider before making your selection of flowers and herbs. You would need to have your ‘Language of Flowers’ book close to hand to ensure you were imparting the right message. Today with guide book in hand it would still be possible to make a beautiful little tussy mussy that really would, say it with flowers.